MINNEAPOLIS, MN--(Marketwire - February 5, 2010) - Apple continues to lead Dell and HP in customer service quality for phone-based technical support, but HP made marked improvements since 2008, according to the latest study conducted by Vocal Laboratories Inc. (Vocalabs). In 1,157 telephone interviews immediately following a support call in 2009, 64% of Apple customers were "Very Satisfied" with the experience, compared to 45% of Dell customers and 47% of HP customers. Compared with 2008, HP customers in 2009 found it easier to reach an agent, experienced fewer problems with the automated portion of the call, and felt like they were made to go through fewer repetitive steps. These changes led to a 9 percentage point year over year improvement in customer satisfaction with the agent at HP, and a whopping 17 percentage point improvement in customer satisfaction with the automated portion of the call. HP nearly tied Apple in this metric, with 39% of HP customers reporting they were "Very Satisfied" with the automated portion of the call, compared to 42% of Apple customers. "Rising customer satisfaction at HP demonstrates the connection between the service customers receive and their overall satisfaction with the company," said Peter Leppik, CEO of Vocalabs. "When things go wrong, customers need to be confident that they will receive effective, friendly, and prompt assistance. With complex consumer electronics, this is as much a part of the product as the design and packaging." The National Customer Service Survey (NCSS) compares customer service quality for different companies in the same industry, using survey data and call statistics from the companies' customers. The NCSS is underwritten and conducted by Vocalabs, independently of any of the companies covered. Download the Executive Summary by visiting www.Vocalabs.com/Press. To subscribe to the full data set, contact Vocalabs at inquiry@vocalabs.com, 952-941-6580, ext. 206. Vocalabs helps leading brands improve customer service by collecting timely, actionable feedback about customer service quality. We interview customers immediately after a support call, retail store visit or IVR interaction while the memory of the experience is still fresh. Using our powerful reporting and analysis tools, clients discover and share insights to improve business decisions. Learn more at www.vocalabs.com. 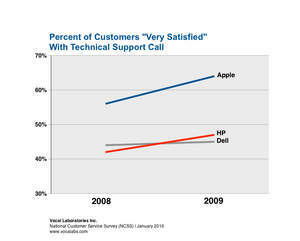 About this company Vocal Laboratories Inc.
Apple continues to lead Dell and HP in customer service quality for technical support calls, according to the latest study conducted by Vocal Laboratories Inc. (Vocalabs).